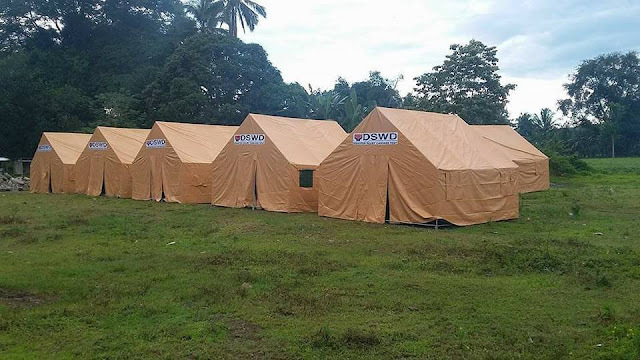 MANILA, June 27 -- The Department of Social Welfare and Development (DSWD) has set up temporary tents to shelter evacuees from Marawi City currently staying at the Madrasa Campong in Pantar, Lanao del Norte, so that the Madrasa could be used by students learning Arabic. In a news release issued Tuesday, the department said similar tents are being set up in all evacuation centers in Iligan City, Balo-i, and Pantao Ragat. According to the DSWD’s Disaster Response Assistance and Management Bureau (DREAMB), the number of families affected by the conflict in Marawi City has reached 82,767, consisting of 403,052 persons. The crisis has affected the city’s 96 barangays, as well as 20 municipalities in Lanao del Sur, and two municipalities in Lanao del Norte. The DSWD’s office in the Soccsksargen region on Monday continued to distribute Ramadhan packs to 972 families staying in Buru-un, Maria Cristina, Ditucalan, Suarez, and Upper Tominobo in Iligan City, as well as 1,928 others in the areas of Tipanoy, Abuno, Poblacion, Del Carmen, and Pala-o. Likewise, the DSWD’s office in Northern Mindanao released the PHP1,000 cash aid to evacuees in Munai, Lanao del Norte; and Tomas Cabili, Villa Verde, Lower Hinaplanon, Sta. Elena, and Buru-un in Iligan City. Meanwhile, Vice President Maria Leonor Robredo visited the National Disaster Risk Reduction and Management Council (NDRRMC) Emergency Operations Center in Iligan City where she was briefed on the ongoing status of disaster operations.